Don’t try this at home! Here I’m out for a little ride in Sedona Arizona. Mountain biking makes me feel alive. And if you’re reading this, then my hunch is that you feel the same way. There are basically two types of mountain bikers. There are the ones that go down a trail, see an obstacle, and either go around the obstacle or walk it. Then there are folks like me. We’re the ones that look at the obstacle, draw on our training and practice, and ride right over it. And the next day, we come back and do it again even better. We’re on a constant journey to get better, have fun, and experience everything that mountain biking has to offer. 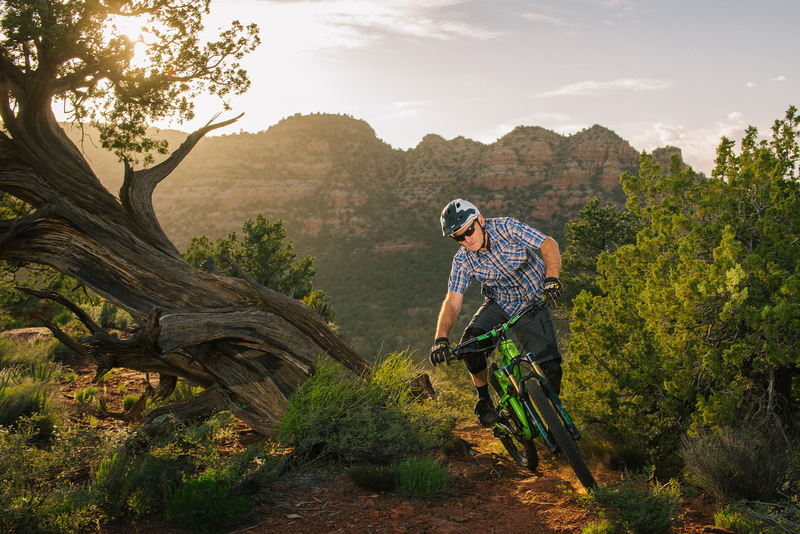 If you love mountain biking and you want to take your riding to the next level QUICKLY, then this 48 Hour Mountain Biking Transformation is for you. I was pretty much crazy from the beginning. The earliest memories of my life included riding my bicycle as much as daylight allowed. Building jumps and trying to see what was possible on a bicycle, it just made me feel good and it still does today. When I was 8, we left our suburban life in Johannesburg South Africa and headed for a new and adventurous life in the Zimbabwean bush. I had to take a break from cycling because we were surrounded by tons of African wildlife including big cats. If you’ve ever had a cat, you know that instinctively they chase quick moving objects. My parents thought it would be best if I didn’t give the cats an easy target. They were pretty smart. Before mountain biking, I was into motorcycles. I had a (very) brief career racing both dirt bikes and crotch rockets which ended when I came very close to becoming paralyzed in a dreadful accident. My short lived motorcycle racing experience was over, but mountain biking was just becoming a thing. I had to have one! That was in the early 80’s. Every free minute since then, I’ve been pedaling. It was what I was supposed to do! By the mid 80’s I was racing mountain bikes as often as possible. I had the same feeling I’d experienced on a dirt bike but I was on a bicycle, I loved it. 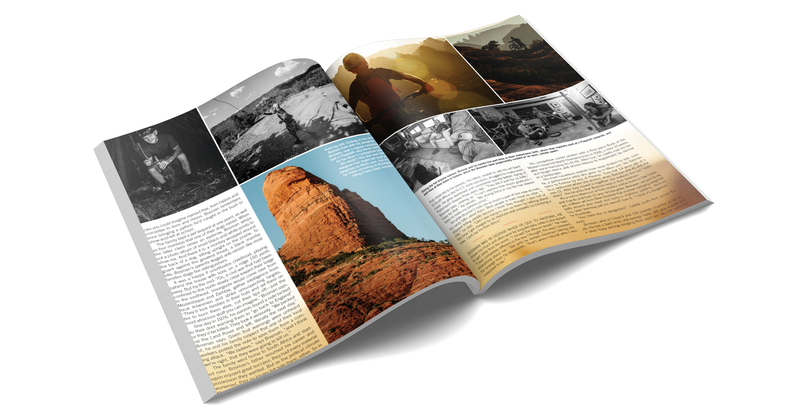 I’ve had some amazing experiences along the way, including this feature article about me in a recent issue of Bike Mag. In the early 90’s my local bike shop had decided to sponsor me and was paying my entries and some of my associate expenses. Best of all my equipment was always new and in tip top shape. I was now paying wholesale prices for all my bike stuff… life was good. At the end of ’96, I was offered a position on a National team. Champion nutrition /Cytomax. I was now not only getting everthing I needed for free, but I was being paid to race and race I did. It was awesome! I was in the big league and the competition was really tough. I was winning most of the regional events but Nationals were another story. I made the podium once on the National stage in ’97. I was obsessed with getting faster. The ’98 season rolled around and something had shifted. I now had a better understanding of what I was capable of and my confidence was at an all-time high. Soon after, I won three of my next 5 events, culminating in winning the National Championship race. I won the season on points and the championship race. Eventually, I even received notice that I’d qualified for team U.S.A. Masters World Championship Team in Montreal Canada. Believe it or not, racing had now become a high stakes job and I wanted out. It had been fun but I was ready for something new. Since my racing days, I’ve mainly focused my riding on having fun and really working on my technique. I’ve cut my racing back to just a handful of events each year. I still love doing it but it’s no longer a driving force in my life. About 5 years ago I realized that I needed to become a coach, to teach proper technique and pass on my years of experience and knowledge. Coaching is undoubtedly what I’m supposed to be doing. And that’s why I created the 48 Hour Mountain Biking Transformation. My coaching style focuses on fundamentals. That doesn’t mean “easy.” Fundamentals are how you take your riding to the next level, no matter WHICH level you’re on right now. I often coach advanced riders (and even some pros!) who haven’t mastered their fundamentals. This shows up in your riding, no matter how “good” you think you are. 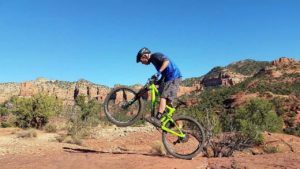 Most mountain bikers can move the pedals, but when it comes to really riding with confidence and ease, that’s where the lack of training comes through. I make sure my clients building block skills are rock solid. We learn how to turn mountain biking into a flowy dance rather than a rough and tumble activity. Understanding how to use your center of mass to your advantage and how it plays into every move that there is…that’s the key. During this transformation, you’ll learn how it feels to be on the center of the bike and why it’s so important. You’ll discover the importance of correct pressure control and when and where it applies. You’ll learn to drive the bike with your feet through pressure control. Jumping comes easily when you know how to bunny hop. You’ll be surfing the red dirt wave. Just so you know, the 48 Hour Transformation is intense. 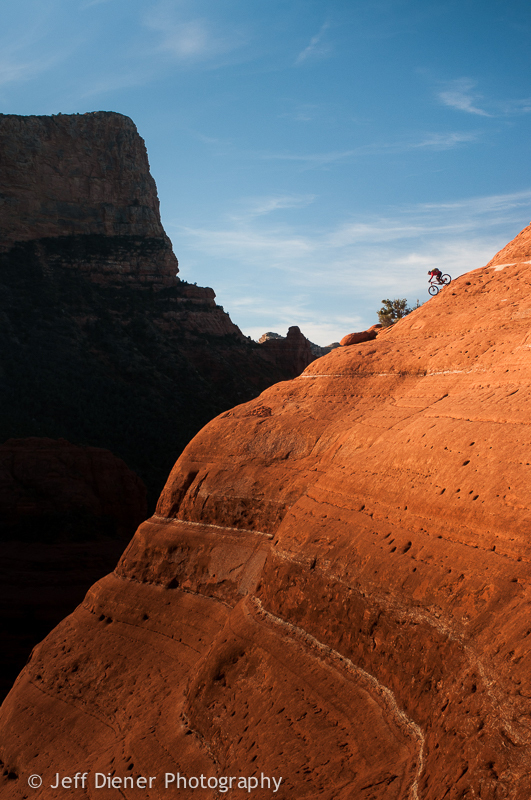 It may also be the most fun you’ve ever had on a mountain bike. The two days of the Transformation will be focused on building your skills in key fundamental areas. We’ll spend the morning of both the first and second days working on identifying weaknesses in your fundamental skills, and show you how the fundamentals are used in ALL future skills. In the afternoon we will execute. We’ll use specific obstacles to drill your new skills out on the trail under my direction. Whether you’re beginner, advanced or somewhere in the middle, you’re going to go to the next level. The fundamentals don’t change, only your ability to master them and what you do with them change. Over the course of the two days, I help you identify your strengths and help you understand the physics of why things are done. You’ll understand how it feels to be in the right place at the right time on the bike. Understanding this is a game changer. Cornering: Correct cornering technique allows you not only to maintain momentum through corners but to accelerate out of the corner. This is how you keep your speed no matter what’s going on. Braking: Brakes on a mountain bike should be thought of as the accelerator. I know this sounds backwards, but it’s super important. Being able to maximize your braking into the shortest distance possible is a must. Learning to brake as if turning on a light (gently with a dimmer switch) keeps your center of mass from constantly being thrown off balance. You need to be able to gently move back as you brake, always remaining balanced and feeling the braking through you feet rather than the handlebars. Pumping: Pumping is repeatedly applying pressure through your feet, effectively increasing and decreasing your weight while traveling along the trail. With every ripple in the trail, pumping allows you to accelerate without pedaling. 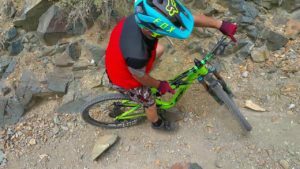 And instead of riding over rough, rocky sections of trail and loosing momentum, pumping allows you to float lightly and efficiently over them while often accelerating. If you’ve never felt this, you’re going to be amazed when you do! Bike and Body Separation: Being able to separate the bike’s rough movements from your movements is crucial to creating a smooth ride. With this skill you can start a graceful and efficient “dance” where you are flowing down the trail, rather than bouncing like a ball over every imperfection in the trail. Counterbalance: The art of counterbalance is key to technical riding. Being able to move the bike side to side and forward and aft while you remain centered, that’s the goal. The narrower and rougher the trail bed the more important this becomes. Think of riding slowly along a 4″ parking lot stripe. It is made substantially easier when you can stay centered but still allow the bike’s side to side movements to counterbalance as you go. 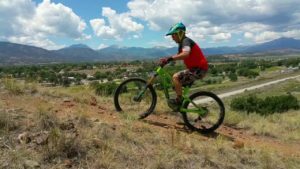 Center of Mass: Learning to use your center of mass (COM) to your advantage is hugely beneficial in mountain biking. Think of your COM as a heavy medicine ball located behind your belly button. You just have to learn to direct its path gracefully, then everything else will then follow along. Learning to harness the movement of your COM is the foundation of every skill, from cornering to back flips. Like I said, we’ll cover a LOT. The goal isn’t just to make you better, it’s to completely transform the way you approach riding. That’s the TRANSFORMATION I’m talking about. You will be a better rider FOREVER because of this. That’s my promise to you. This is an optional upgrade that includes a private 90 minute ride with me. We’ll work on applying what we’ve covered over the previous two days and also have a great time riding. The fee to attend a 48 Hour Mountain Biking Transformation, presented by ME in conjunction with Trail Sports Mountain Bike Shop, is $1,500 per person. You can add the optional Day 3 upgrade for an additional $300. A 50% deposit is due to reserve your spot and the balance is due before we begin. Please Note: these fees cover the Transformation only, you’re on your own for lodging and food. (Although I’m happy to give you recommendations because there’s some good eating here!) There won’t be more than 8 people in the group so there’s plenty of time for customized attention during the two days. I only offer a few of these Transformations each year. If you want the calendar, please enter your email address below. I’ll send it over!